Last September, I wrote about how I deal with money when traveling. 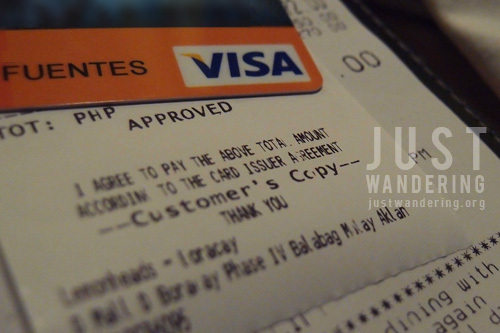 Last January, while in Boracay, I was finally able to try using a Visa debit card. It indeed, worked flawlessly like a credit card. After a sumptuous meal at Lemon Cafe in D’mall, I realized that I didn’t have enough cash with me to pay for my meal, so I paid using the card, knowing that this is one of the establishments in Boracay that accepts credit card payments. I was worried that their machines wouldn’t support debit cards, but turns out I didn’t have anything to fret about. The transaction went through without a hitch — I didn’t have to wash the dishes to pay for what I ate, and didn’t have to worry about credit card bills and interest rates. After dinner, I made sure to stop by the ATM to make sure I have enough cash to last me until Kalibo and Manila. Again, my Visa debit card is out my wallet and fed into the ATM’s card slot. I was able to get my cash, the only charge was for using another bank’s machine — no cash advance fees to add to my bill. Works great as an ATM card too! I was already quite satisfied with the card by then, but the biggest surprise came when I came back to Manila. As you know, the Philippine Blog Awards has partnered with Habitat for Humanity to build the “Bahay Blogger” to benefit the homeless people of Navotas. Unfortunately, the donation page only accepts credit card payments. I was in a pickle because I wanted to help out, but at the same time, I don’t want to use my credit cards anymore. I took a chance and keyed in my Visa debit card number. Much to my delight, the payment went through! If I’m able to use the card on one website, I’m guessing I can use it for a handful more. Would it work on online airline bookings? Dundundun! Let’s wait and see, shall we? Same here. I love VISA debit cards, too! I usually use them when I book for flights online and for buying stuff when I don’t have cash. Btw, thanks for the info about Habitat for Humanity donations. God bless! i think debit cards are better to use rather than credit cards.for one thing, you only spend what you have loaded in the account. i use debit cards all the time in my online transactions. Nice story. I have not yet used my EON on counter payments, but I’m already using them for my online purchases. Using debit card has an advantage of not worrying for future obligations, since you only use what’s on your fund, unlike credit cards that you incur debts. However, credit card users are more protected by the credit card companies. While debit card users are responsible for their own money. actually my union bank eon visa card works in online booking ive booked many times with cebpac and i never had any issue. now i have the card with me in Qatar and am planning of using this here. havent tried it in any shop but am hoping there shouldn’t be any problems with that. just a quick question though, is there additional charge when swiping your eon card internationally? As far as I know there’s no additional charge for swiping overseas. I’ll verify this next month Thanks for sharing your experience with using it online! I’ll have to try it sometime! I have used Visa Debit card several times in different places. I don’t carry that much cash with me thinking it will riskier. so i pay most of my purchase especially in other countries by credit / debit card. works just fine! i looked at my statements and bills, they’re not that much either. 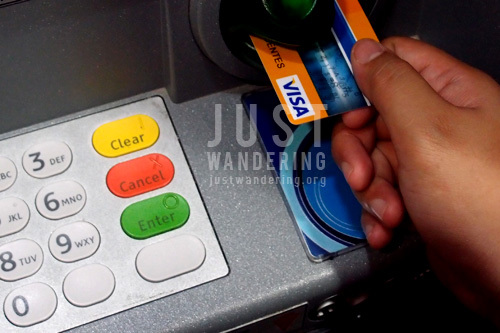 Just keep enough amounts in your debit card while traveling! can i use my RCBC MyWallet Visa Cards through online bookings of tickets in Airphil, Cebu Pacific and even PAL? How? There are websites that can process payments using debit cards, while there are some that cannot. Verify with your bank if your card can be used for online purchases. I haven’t tried booking flights through those websites using a debit card.